Freakbeat is a primarily European rock music genre that peaked between 1966 and 1967. Elements of the freakbeat sound include strong direct drum beats, loud and frenzied guitar riffs, and extreme effects such as: fuzztone, flanging, distortion and compression or phasing on the vocal or drum tracks. 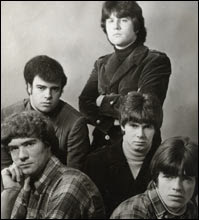 Often used to describe the European counterpart to the psychedelic garage rock of American groups like The Seeds, The Thirteenth Floor Elevators, and The Standells, freakbeat is most often applied to music originating in the UK, although many artists on the European continent also contributed to the freakbeat style. Some of the best-known examples of the freakbeat genre include the British hits "Take a Heart" by The Sorrows, "Making Time" by The Creation, and "I Can Hear the Grass Grow" by The Move. Much of the material collected on Rhino Records's 2001 box-set compilation Nuggets II: Original Artyfacts from the British Empire and Beyond, 1964-1969 can be classified as freakbeat. The term "freakbeat" was invented (after the fact) in the 1980s by the music journalist Phil Smee, to retroactively describe a music style that has been described as a missing link between the early to mid-1960s mod R&B scene and the psychedelic rock and progressive rock genres that emerged in the late-1960s with bands such as Pink Floyd. Freakbeat music was typically created by four-piece bands experimenting with studio production techniques.